Solar-Vision publishing is PROUD to present this unique cookbook. The author has taken the menu of a modest but small 50+ year old New York Jewish Deli/Restaurant (it's a very small place, but the food is renowned for it's excellence. People fly from all over the country to eat at this place - which is why the author chose this particular menu to replicate), and replicated the ENTIRE MENU - with recipes scaled down and replicated for HOME USE!! This food tastes EXACTLY like the dishes served at this famous eatery. Using her knack for replicating recipes in the kitchen, and through interviews with the chefs and staff, the author has successfully created this VERY UNIQUE Jewish cookbook. 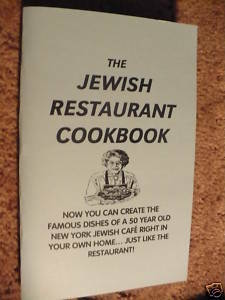 The recipes are all KOSHER. Book includes the ACTUAL MENU - as well as page numbers (instead of prices!!) directing you to the page of the dish. RECIPES INCLUDE: Potato liver Knishes, Spinach and cheese knishes, Kasha and mushroom knishes, Butterbean hummus, Spicy orange hummus, Artichoke dip, Baba Ghanoush (eggplant dip), Bread N Butter pickles, Dill Cucumber salad, Salmon pancakes, Potato pancakes, Kosher potato salad, Three bean salad, Bagels, Noodle Kugel, Honeyed Hahit, Anasazi bean soup, Mashed potatoes, Cole slaw, Spinach souffle, Isreal salad, Chopped Chicken liver, Gefilte fish, Mock chopped liver, Rib roast and potatoes, Eggplant parmasean, Vegetarian Gifilte fish, Jewish meatloaf, Caramel Kugel, Cheese Blintz, Parve peach cake, Iced coffee, Lemon tea.